Outfit your clean room with stainless steel lab tables and gowning bench from Eagle Group and Metro that adheres to your critical environment! Choose from Galvanized shelf and legs, stainless steel shelf and legs, stainless 3-sided frame, stainless H-Frame, stainless C-Frame, galvanized tubular base, stainless tubular base bench. The cleanroom tables are available with solid or perforated tops, with and without backsplash, polished, brushed or electropolished finish. Perforated Stainless Steel Tables provide the optimum cleanroom work surface for vertical flow cleanroom operation. They allow uniform air flow through the work surface and eliminate stagnant air pockets that are on or above the work surface of all solid top tables. 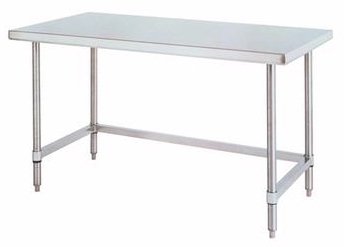 Metro Stainless Gowning Bench with heavy-duty solid top bench provides a sturdy and comfortable gowning fixture. Top is manufactured from 14 gauge, Type 304 stainless steel. Stainless steel foot plates provide floor mount or free-standing option. Eagle Group Stainless Steel Gowning Bench. Type 304, 14 gauge stainless steel. Stainless steel channels run underside for added stability. Legs: 1-5⁄8˝ diameter, 17˝ high, 16 gauge type 304 stainless steel. 12˝ wide benches that are 72˝ and longer, consist of six legs. Legs joined by stainless steel front-to-back cross bracing. Legs recessed in gussets that are joined to channels that run underside top. Foot plates: Heavy gauge stainless steel, flanged. Allows for bench to be bolted to floor if desired. 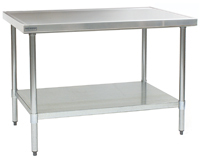 Eagle Perforated Top Stainless Gowning Bench. Tops: Front and rear feature a rolled edge, with ends turned down 90°. Electro polished and stainless steel finish available on all tops. 18" wide with 3/4" perforations on 1" centers, allowing a 40% laminar flow. Legs: 1" diameter posts, 19" high, 16 gauge type 304 stainless steel. 72" benches consist of six legs. Foot plates: 13 gauge stainless steel, triangular. Allows for bench to be bolted to floor if desired. Under shelf: Features patented Quad-Truss® design (patent #5,390,803). Available in 304 stainless steel or 304 electro polished stainless steel. 14" x 36" wire shelf, type 304 stainless steel. 72" benches consist of two 14" x 36" wire shelves with S-hooks.